The 800 series is equipped with Avant quick attach system for attachments - other systems like Euro 3 will be available as an option. The hydraulic hoses of the attachments are coupled with the multi connector, which allows easy connecting with a single hand movement - in all conditions. Hydrostatic transmission with a hydraulic drive motor on each wheel together with two drive speed areas is a familiar feature of Avant compact loaders. Max. drive speed of the 800 series is 18.5 mph and auxiliary hydraulics oil flow for attachments is as high as 21 g/min. Telescopic loader boom is standard feature on 800 series as well. The boom extends and retracts hydraulically 32.5 inches and gives a max. lift height of 11.5 feet to the hinge pin. This enables loading on trucks with high sides, on mixer feeder wagons, etc.. The hydraulic self levelling system keeps the load automatically level when lifting and lowering the boom. The 800 series is equipped with Avant's quick attach system for attachments – other systems like Euro 3 will be available as an option. The hydraulic hoses of the attachments are coupled with the multi connector, which allows easy connecting with a single hand movement – in all conditions. Avant 800 series has a certified ROPS/FOPS open cab as standard, in addition an enclosed heated cab is available as an option. This DLX cab mounts on the chassis of the loader with anti-vibration mounts, which guarantees excellent noise and vibration isolation. Efficient heating and ventilation and large windows further improve user friendliness. The DLX cab can be equipped with air conditioning as well. The comprehensive Avant attachment range – over 200 attachments – is available for 800 series also. 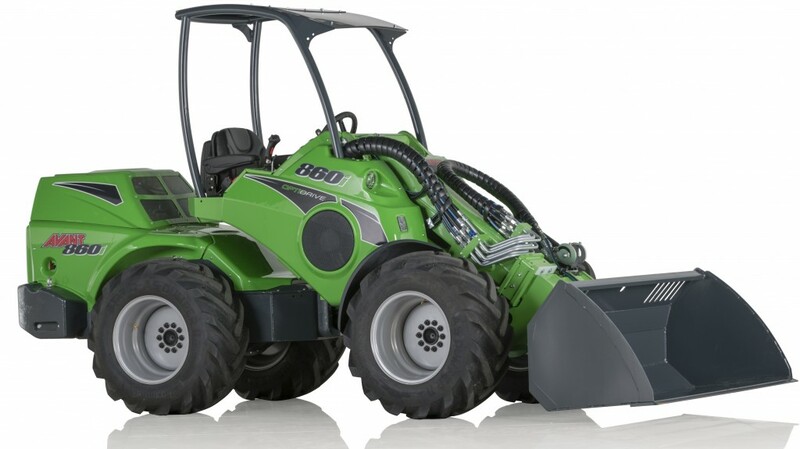 This makes the 800 a very versatile and useful machine for many different customer groups: landscaping, construction, property maintenance, agriculture, various material handling jobs etc. The Avant 800 series will be introduced at the bauma 2019 exhibition in Munich, Germany on 8.-14. April.